William Robertson Aitken, born in Dunbar1 on 19 March 1873, son of Archibald Aitken and Ann (Taylor), was Secretary and Manager of the Hendon Paper Works Company and Arthur Linfoot’s boss during his early years there, before he left to join the RAMC in July 1915. Mr Aitken had come to Sunderland in the late 1890s to take up a post as Head Clerk at Hendon Paper Works. He had subsequently risen to become Secretary and Manager at the company, a career trajectory not unlike that of Arthur Linfoot himself after he rejoined Hendon Paper Works following the war. Mr Aitken is first mentioned in the diaries on 5 January 1914 and at intervals thereafter until shortly after his death in September 1917. He appears to have been a formidable boss – the diary records occasional acts of discipline against employees guilty of various misdemeanours – and was evidently fairly ruthless during times of austerity, on one occasion giving staff their notice while also encouraging them to join the armed forces. Nonetheless, Mr Aitken appears to have been popular and well liked among his business peers and in society as a whole and his untimely death in 1917 at the age of 44 was widely reported in local papers both in North East England and in Scotland. 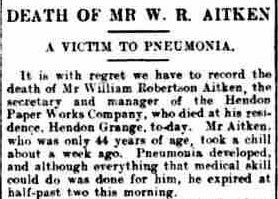 It is with regret we have to record the death of Mr William Robertson Aitken, the secretary and manager of the Hendon Paper Works Company, who died at his residence, Hendon Grange, to-day. Mr Aitken, who was only 44 years of age, took a chill about a week ago. Pneumonia developed, and although everything that medical skill could do was done for him, he expired at half-past two this morning. Mr Aitken came to Sunderland about twenty years ago from Dunbar, Scotland, to take up the position of head clerk at Hendon Paper Works. Later he became secretary and manager, positions which he has held ever since. He was regarded in paper trade circles as a highly capable business man. Indeed this estimate of him was general with all who came into contact with him in business matters. In politics he was a Conservative and an ardent Tariff reformer. He did valuable work in advocating his opinions on fiscal matters and in helping candidates with those views in local elections. A member of the Chamber of Commerce, he was a frequent attender at that body’s meetings and took an active part in the work of the Chamber. In religion he was a Presbyterian and was a member of St. George’s Presbyterian Church. Mr Aitken took a great interest in outdoor sports. He was a prominent figure in the bowling2 world and was a member of the Ashbrooke club3. As an international player he took part in the England v. Ireland match at Belfast some years ago. He was a good swimmer and golfer, and in the latter connection was a member of the Seaham Harbour Club4. Those who had the pleasure of his acquaintance found him a charming companion and friend, and his death will be greatly regretted by a wide circle, and especially among those who met him in the various sports in which he took part. He leaves a widow and two children, a boy and girl, and the interment has been fixed to take place at Edinburgh on Monday. 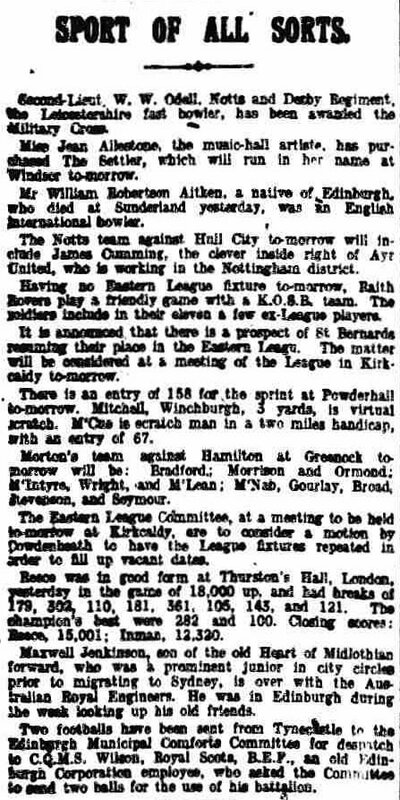 Mr William Robertson Aitken, a native of Edinburgh, who died at Sunderland yesterday, was an English international bowler. The funeral of the late Mr Wm. Robertson Aitken, secretary and manager of the Hendon Paper Works, who died at his residence, Hendon Grange, on Thursday last, took place to-day at Edinburgh. Last night a memorial service was held at St. George’s Presbyterian Church, of which Mr Aitken was a prominent member. There was a large congregation, and in the unavoidable absence of the Rev. J. Millar Craig, minister of the church, the service was conducted by the Rev. John N. Reid, of Middlesbrough. Prior to the departure of the body from the town to Edinburgh a service took place in the grounds at Hendon Grange, at which there was a large gathering of employees and friends and at which the Rev J. Millar Craig was the officiating clergyman. William Robertson Aitken was interred at Grange Cemetery in Edinburgh. He was joined there in 1941 by his son, William Archibald Aitken, who was killed by enemy action on 11 May 1941 while engaged in home guard duties in London, and in 1959 by his wife, Janet, who died in Ascot on 15 August 1959 at the age of 85. I am indebted to Jeff Beaumont for his research which contributed extensively to this page. Newspaper images and text above are sourced from the British Newspaper Archive.